We are in the dog days of summer here in Langley. It’s sunny. It’s warm. And so…no-fuss, light, cool dinners are gracing the menu in my household. Like salads, for example. My salade du choix tonight was quite delish and so I feel compelled to share. First of all, I whipped up a decadent and creamy mayonnaise-like dressing that I found on the Choosing Raw (www.choosingraw.com) website. 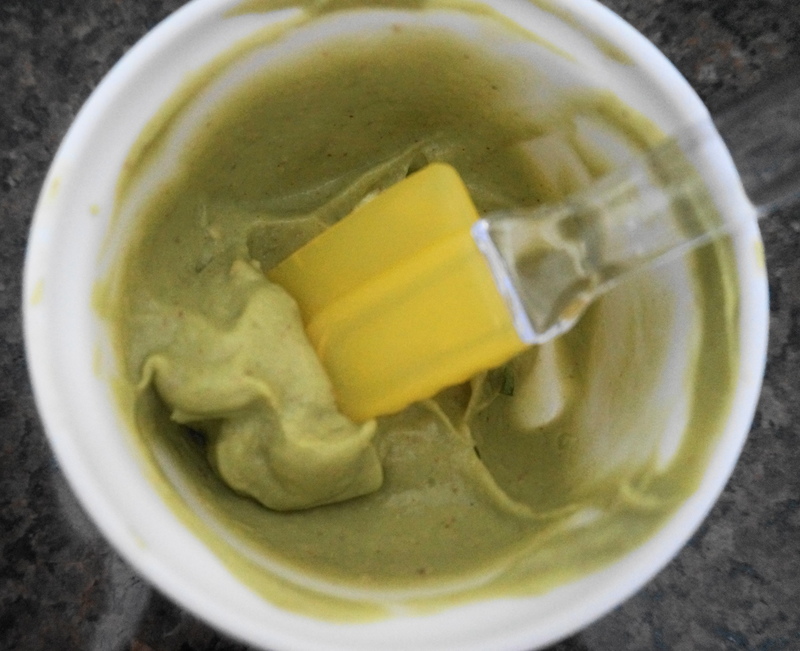 Into my Vitamix went the innards of 1 small avocado, 1 tbsp. of fresh lemon juice, 1/2 garlic clove, 2 tsp. mustard, and about 1/2 tsp Himalayan sea salt. 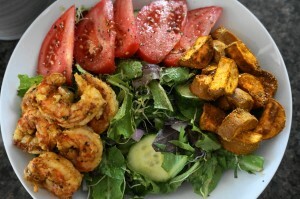 As I was blending these ingredients, I drizzled in 2 tbsp. of extra virgin olive oil. I then gently tossed a couple of big dollops of this dressing into my simple salad of chopped mixed greens, diced red onion, paper-thin cucumber slices, and alfalfa sprouts. Salad nicely sauced, I heaped it into one of my favourite big white bowls. 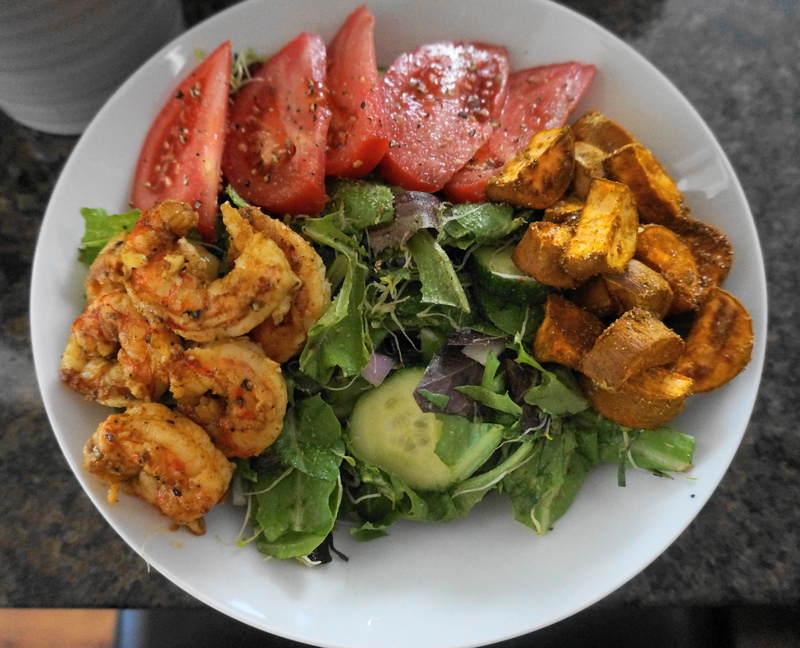 Meanwhile, I had sautéed a few prawns that had been marinating in olive oil, curry powder, sea salt and pepper. I mounded these atop my salad. I had also chopped up a very small yam, tossed the chunks with a tad of coconut oil, curry powder, sea salt and pepper, and roasted the lot at 375 degrees for 30 minutes. These were also plunked onto the salad. Wedges of a sun-warmed field tomato completed the salad-scape. 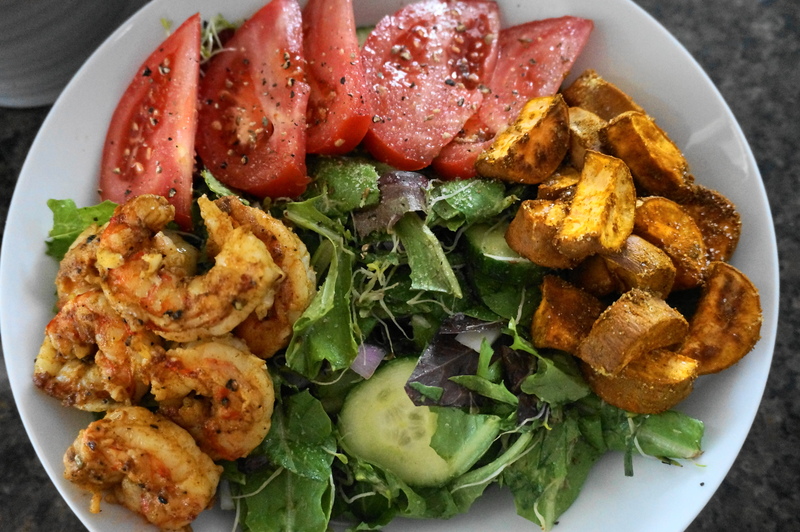 Summer salad with prawns and yams. A lovely meal for a warm summer evening.